A Portrait of California, 2014-2015 is a new report by Measure of America that adopts the Human Development Index to measure how Californians are doing in health, education and income—the building blocks of a decent life and the core areas of United Way's community impact work. We invite you to explore county-level maps we created using data from A Portrait of California, 2014-15. 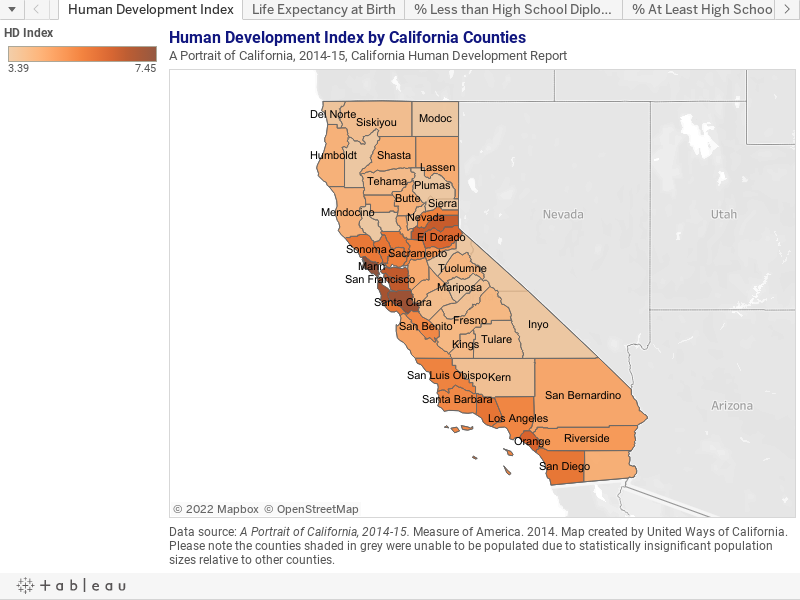 Simply hover your mouse over a county to view their Human Development Index, or click through the various tabs to explore how Californians measure in life expectancy at birth, educational attainment, median personal earnings and more. For more detailed maps, including those at the neighborhood level, visit Measure of America at http://www.measureofamerica.org/maps/.